What could be more inspiring than painting using a set emblazoned with the designs of a real live artist? Vilac and pop artist Keith Haring have teamed up to create a gorgeous watercolour set for aspiring… well, aspiring Keith Harings. The paints are in a sturdy tin case decorated with the absurd, cartoonish imaginings of the artist. There are pigs in skirts, creatures with arms coming out from the tops of their heads and bizarre birds with necks like llamas, all punctuated with splats of colour. 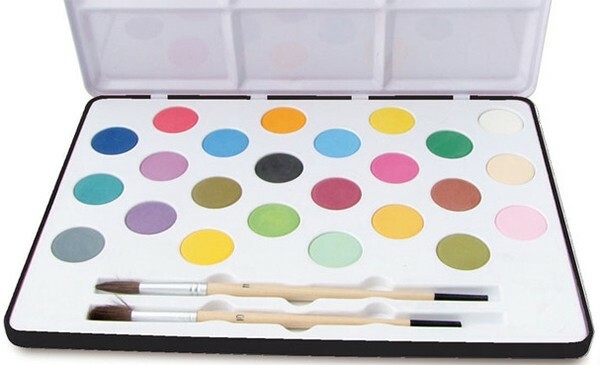 Inside you’ll find two small paint brushes and 24 discs of watercolour paints. The hues aren’t the usual colour wheel cast of characters. There are gorgeous pastels like shades of turquoise, lilac and pink, khaki greens and lovely golden yellows. That way if kids paint on the walls, it might look contemporary instead of like a mess. The Vilac and Keith Haring watercolour set is $32 and ships locally from Little Smiles.